Stupid TuffRider pad. It's a do-not-buy for several reasons. Connor and I had a really good practice ride yesterday. A really good ride. My trainer may have been kidding about 500 halts before our next lesson, but she wasn't kidding that it was homework. So after we established forward, then body control (a January goal! ), I started asking for straight halts. What I noticed is that he couldn't halt straight if he wasn't straight in the preceding gait. So if his shoulder was popped at the walk, even so slightly that I wouldn't have noticed it a few months ago, he couldn't halt straight without me making some last second corrections. 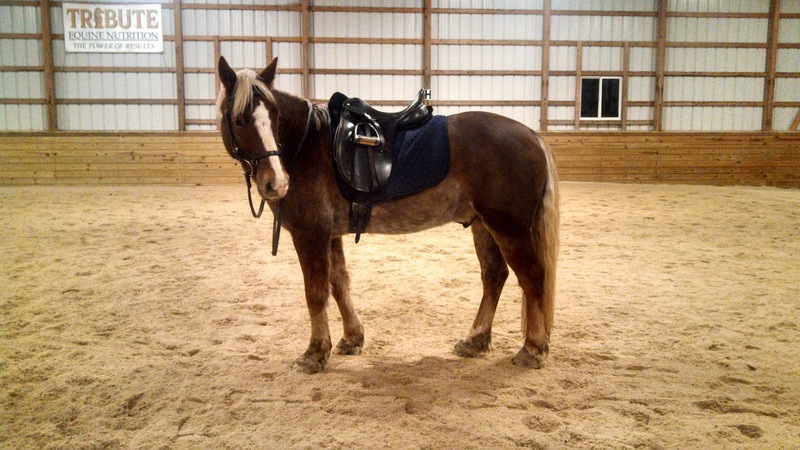 To address that, in between halts I added the exercise from about a month ago in which she had me feel when his weight was on his inside shoulder, then use my inside leg to shift his weight and then my outside rein to catch that shift. I also continued to throw in a stride of counterbend every so often. Once he was traveling straight, we could halt square. I felt a little stupid for not realizing it earlier, it seems so obvious now that if his weight is more on one leg than the other, he's going to halt like that too, with that leg parked out or that shoulder thrown around. This is what she meant when she said we need to drill our basics. He felt really, really good by the end of the ride, and I quit after he gave me like 10 uninterrupted minutes of really nice trot work, equal in both reins. They have apparently been busy since Sunday, making a real stall out of the area that was once a stall, then was an aisleway, and now is a stall again. They were nowhere near finished constructing it when I took this picture (pipe gate is definitely temporary, for example! ), but I like it so far! 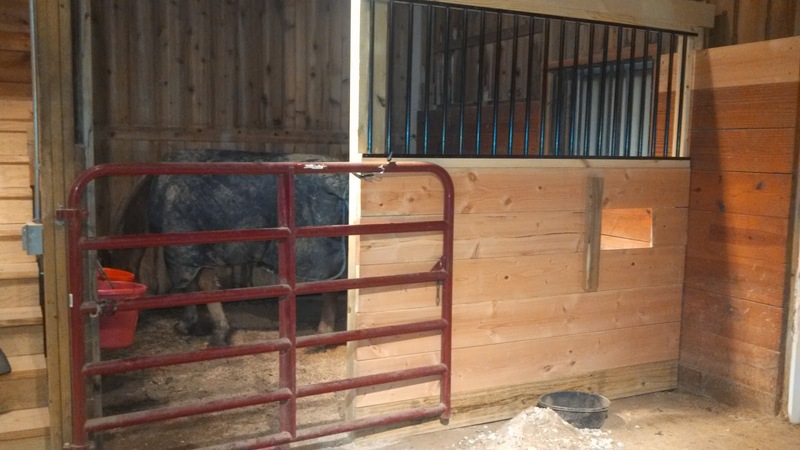 Talk about proximity to the indoor: the back "wall" of his stall is a sliding door, and the indoor is like 15 feet from that door. We'll see what the final iteration ends up being! Cob proof: tight bungie cord holding the gate closed, back wall is both latched and has a concrete cinder block in front of the door. You shall not escape! Haha, the idea of horses as escape artists so so foreign to me. Last weekend I left Guinness in a stall with the door hanging open 5 inches (I forgot to close it) while I went for an hour long run. You speak the truth when it comes to halting. We've been working on halts, too. Not necessarily straight halts, but soft ones. Buh. So tired of halts. ^YES riding a straight horse is way harder then you'd think!! Totally. No wonder we have to keep taking lessons, it takes years to teach us/them how to go straight! Normal people wouldn't understand. I just started following your blog. Connor is adorable! Thanks! I've been following yours for a couple of weeks now, Loki seems like a good man! I saw some XC jumps I recognized in one of your posts, were you at Greater Dayton HT last May? We were there, it was our first XC course ever. Maybe I'll run into you this year? I wasn't there but my trainer had Loki there in Beginner Novice. I was still in Japan (military) but we do plan on being there together this year. We live just about 20-30 miles from twin towers where Greater Dayton is located. I'll have to look for you! Being straight is like the hardest thing EVER. Trotting a straight centerline? Forget it. These are some good tips, though, I'll have to try them with Paddy. All those legs are hard to keep track of every second of every ride, though! The halt is underschooled...good for you guys for working on it!